A fantasy character - lava golem, probably a child of some old volcano which doesn't want to be disturbed by any visitor. Model is based on a concept - http://www.render.ru/gallery/show_work.php?work_id=72971 so many thanks to Boris. for his awesome artwork! Unfortunately, textures I made are based on photos taken from cgtextures.com so I can not provide you with them here on opengameart, hence this .blend contains only glow map which is made totally by me. Sculpting could improve this greatly. Why not use textures from here on OGA? There are some good ones around. i dunno - those (C)'s on the original concept arts make me worry. It's a good submission, and gavlig actually read the submission guidelines and was conscienscious enough to remove the stuff from cgtextures (thank you, by the way -- it's a pain having to remove submissions because of that). @bart: Thanks! :) I'm not discouraged at all. It was kind of a surprise for me that i can not upload texture, but i can live with that. Next time i'll be more selective while choosing banks for my textures. 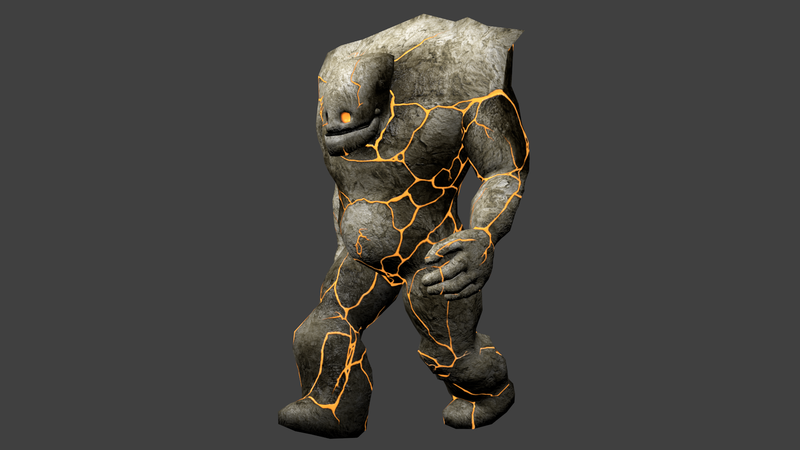 So anyone who is interested in helping the flare project or wants to see this golem being used more widely, you're welcome to help out. Hey i used this item in my second android game and added you in credits.